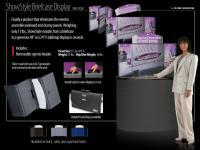 Choose from Three Portable Self Packing Table Top Display Solutions; The original ShowStyle Briefcase Display, The larger ShowStyle Pro 32 Briefcase Display, and the ShowMax Table Top Display. All are easily set up in minutes, pack down into self contained carry-along sizes for easy transport, and can include display lighting, full interior display graphics packages, and Carrying Bag options. We are located in Massachusetts, on the border of Rhode Island and Connecticut. Competitive Quantity Discount Tiered Pricing Available. Please call, email or Contact Us for a free estimate.